In August, 2011, Morrow books sent out a message that they were looking for bloggers to help promote Emeril Lagasse’s upcoming cookbook. Over 100 bloggers responded; 20 were chosen – including me. After the event, 12 of us decided to keep working together on similar projects and to find fun and interesting ways to support and promote each other in ways that our readers would enjoy. The concept is that we occasionally work together – with or without sponsoring companies – to post about a specific theme on a particular day. It’s not a progressive dinner party or a planned menu – we each bring to the table what we’re good at, within the parameters of the theme. A true potluck of posts. And then, like party guests everywhere, we talk about the party in anticipation of what will be there (on Twitter, Facebook, or wherever we happen to hang out) and then we talk about it while the event is running. Then, of course, we help clean up the mess, pack up the leftovers, and chitchat about it afterward. Shortly after deciding we wanted to work together, several companies agreed to work with us even though the idea was completely untested. Abrams Books (with their Stewart Tabori and Chang imprint), California Olive Ranch and Bob’s Red Mill (in a combined promotion), and Marx Foods were the first three. Companies benefit by working with us as a group because they get one person to talk to rather than a dozen individual bloggers. And when the posts go live, they’ve got a lot of bloggers talking about their products all at once. For our blog group, having that one point person saves us time and trouble, because if we’re not running a project we can just sit back and let someone else hammer out the details. We just sign up to attend, we bring our dish when requested, and we chit-chat about it knowing that someone else will make sure we’ve got plenty of forks and ice. The other benefit to the group approach – and this is great for both the bloggers involved and the sponsoring companies – is that during the potluck events we all promote each other. Each blogger has a unique audience and unique strengths and weaknesses. One might have more blog followers, another might have a huge Facebook presence and another might dominate on Twitter. Working together, we are much stronger than we are alone. That makes our group more attractive to companies than 13 individual bloggers working separately, and it benefits our blogs with more visitors and page views during the events – and possibly some new followers afterwards. This approach benefits our readers because we’re giving them good content, introducing them to our fellow bloggers and possibly hosting some fun giveaways. And since we’re picking and choosing the companies we want to work with, rest assured we’re not doing this just for the swag. We like the companies we’re working with, and we like the products we’re writing about. And if a few bloggers aren’t interested in a particular company or product, they’re not obligated to participate. Since these events are sporadic and probably of short duration – as little as just one post – we won’t be annoying our followers with too many tweets about the same thing. We want these potlucks to be fun – and special – for us and for our readers. One great thing about our group is that we’ve all got different tastes, different focuses, different connections, and different talents. If you visit each blog during an event (and I highly recommend that) you won’t see the same recipes or the same photos or the same ideas over and over. We complement each other, we don’t copy each other. Even when our themes are somewhat restrictive or we’re all using the ingredients, we’ll bring different things to the table. 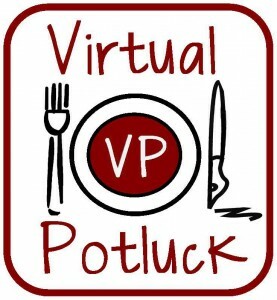 Bloggers: Virtual Potluck is not adding new members just yet, but feel free to drop me a line if you’re interested in joining us if/when we do expand. What an interesting grass-roots sort of idea! Good for you guys. Your blog looks great, I pinned it so I can make sure to check back in sometime.